Most of us love to check things off our list; reply to emails, check. Call Beth, check. Yay, look how much I did today! But deep down inside anxiety builds as you realize it would have been a much wiser choice to write a chapter for the novel you’ve been meaning to finish, or begin the report before the deadline is in your face. 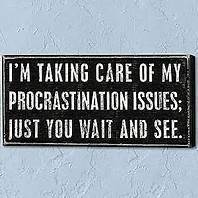 Often we choose to do a task that gives instant gratification rather than doing the one that rewards us in the future. But we all know the tortoise wins the race in the end. 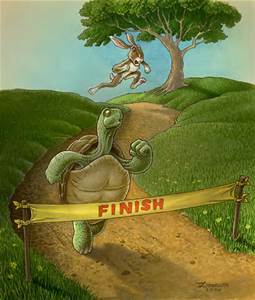 (if you’ve never read the The Tortoise and the Hare, I highly suggest doing so). I believe in this fast past world we need to take a look at the tortoise; how he slowly and steadily plugs along one step at a time. He seems to have much less anxiety in fact he seems to be enjoying his journey. I definitely can’t say I have all the answers on this subject, but I do know if I just show up, and do a little everyday, my life becomes a lot lighter, I sleep better at night and I’m getting that much closer to the finish line.